A sentencing hearing in a Medicare fraud case against a prominent Florida eye doctor accused of bribing New Jersey Democratic Sen. Bob Menendez has been postponed. Attorneys for Dr. Salomon Melgen said in court documents filed Thursday they and prosecutors have agreed to cancel Friday's scheduled sentencing hearing until December. That would be after next month's scheduled joint bribery trial against Menendez and Melgen in New Jersey. Melgen's attorneys say in court documents the delay is necessary because the hearing could take longer than a day. A prominent Florida eye doctor accused of political corruption was convicted of Medicare fraud Friday, increasing the odds that federal prosecutors could pressure him to testify against New Jersey Sen. Bob Menendez. Jonathan Dienst reports. Melgen was convicted in April on 67 counts in one of the largest Medicare rip-off schemes in recent years. Prosecutors said Melgen intentionally misdiagnosed patients for serious eye conditions to inflate and falsify Medicare billing statements. 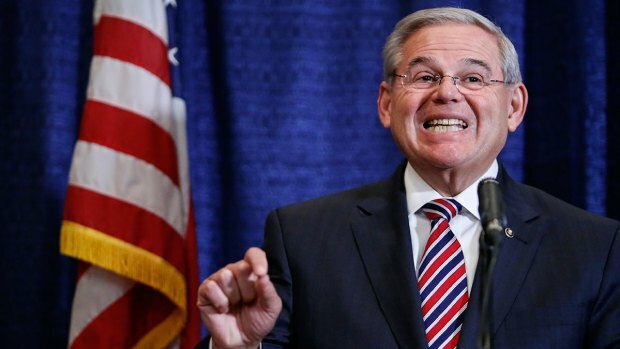 Menendez (D-NJ) is accused of using his office to try to help Melgen get out of millions in federal fines in exchange for campaign cash and gifts, including free vacations to Europe and the Caribbean and free flights on Melgen’s private jet. New Jersey's senior senator is also accused of abusing his office to try to help Melgen win private business deals, including a port security contract with the Dominican Republic potentially worth hundreds of millions of dollars. Menendez is set to go on trial in September in New Jersey, along with Melgen on the federal corruption charges. Both men deny any wrongdoing, claiming in part that they have been close personal friends for years. Melgen faces 15 years in prison when he is sentenced Friday for the separate Medicare fraud charges. “Corrupt health care providers who defraud federal health care systems divert precious tax dollars from where they are needed most," Department of Defense investigator John F. Khin said after Melgen was convicted. Melgen ran his scheme from 2008 to 2013, improperly earning tens of millions of dollars annually, authorities said. For example, Melgen billed Medicare $21 million in 2012 – more than any other doctor in the country. Melgen met Menendez at a campaign fundraiser in 1993 shortly after he opened his eye clinics. Since then, Melgen has allegedly donated almost $700,000 to Menendez’s campaign and a separate political action committee. The FBI said Menendez took numerous free flights aboard Melgen’s private plane as well as accepting a free stay at a five-star Paris hotel. After the criminal investigation began, Menendez said he reimbursed Melgen for the cost of some of those flights. Prosecutors said Menendez helped Melgen’s foreign girlfriends get visas and push for changes to Medicare’s reimbursement policies, which potentially would have generated millions more for Melgen. Prosecutors may try to use Melgen’s conviction as leverage to try to get his cooperation but to date Melgen has shown loyalty to the senator and has denied wrongdoing. Former federal prosecutor Robert Ray says Melgen’s conviction in Florida could spell trouble for both men in the upcoming corruption trial in New Jersey. “You can sort of see the correlation of evidence of intent that amounts to Medicare fraud and evidence of intent to commit honest services fraud," said Ray. His attorney, Michael Menchel, declined to comment. The Supreme Court recently denied Sen. Menendez’s attempt to dismiss his case and U.S. District Judge William Walls ruled this week that the corruption case will move forward, and he will reassess Menendez’s request after the prosecution presents its evidence in this case.